The Arlington meeting will be live streamed at www.nctcog.org/video (click on the "live" tab). A video recording of this meeting will also be online at www.nctcog.org/input. With transit needs increasing throughout the region, NCTCOG is focused on several planning initiatives, including advancing high-speed rail service from Dallas to Fort Worth and Fort Worth to Laredo, completing first-and last-mile connections to rail systems and creating business models for transit initiatives in areas that have no service. 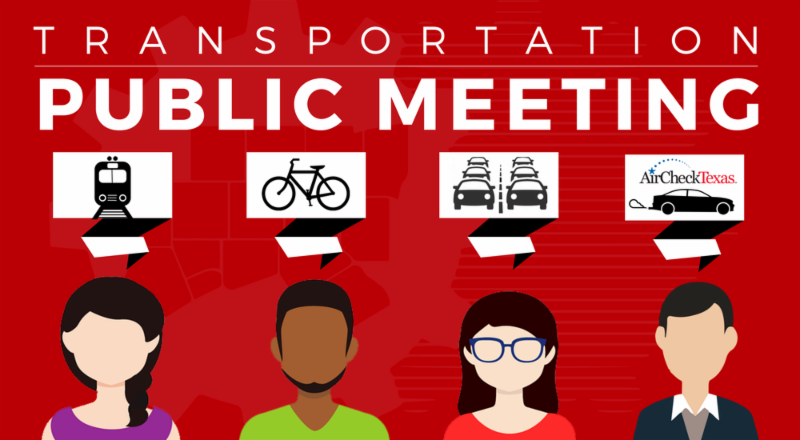 An update on the aforementioned transit projects will be presented. The highly anticipated Beneficiary Mitigation Plan for Texas, under the Volkswagen Environmental Mitigation Trust, will be presented. Attendees will also be provided an overview of air quality funding opportunities available in 2019. The Title VI Program documents how NCTCOG considers civil rights in all phases of planning; the program includes NCTCOG's procedures for complaints alleging discrimination. Updates to the Title VI Program, including clarifications in the complaint procedures, will be presented.